Imagine you and your partner in crime are cruising down the strip towards Vegas in a vintage convertible with the top down and the wind blowing in your face. It’s an hour away from the casino and you both drop a couple blotters from your old Dead Head buddies and start to blast off. Upon entering the casino, which at this point looks more like some type of circus…... The colors begin to astound you. Or is it the beautiful red headed bob shell sprawled out on top of what appears to be a stuffed tiger? As the host asks if you would like another shot, I finally realize that I wasn’t in a casino after all. Rather so actually in my basement playing on my new retro pinball machine, like an Iron Jawed Guru tripping balls. Mouth wide open as your head acts a conduit for color and information. Brain expansion has occurred as we enter the riff salad of “Mata Hari”. Haling out of West Virginia this stoner rock duo brings forth this monster release on Grimoire Records with some outstanding artwork. At times they remind me of Kyuss or early Mastodon. Some sections even have a sweet Tool feel to them. Killer stoner rock riffs without overdone lead guitar. Possibly even strong influences from Helmet are present throughout this album. Driving and groovy guitars intermixed with cascading rolls and cool drum accents. Iron Jawed Guru focus more on the power of the riff rather than only focusing on the tone and how loud they can get. Writing tasteful riffs wins over just solely crushing people’s skulls. At times it they have a sludge influence and the guitarist has excellent use of the wah pedal as well. This duo sounds more like a trio, with how full their sound is. It’s amazing how some guitarist are able to fill up the soundscape with only one guitar. Utilizing powerful grooves and memorable harmonies is an equation for a long lasting great effect. Overall this is a great stoner rock record that is minimal yet quite effective. It’s awesome to hear some old school guitar playing with riff after riff after riff. 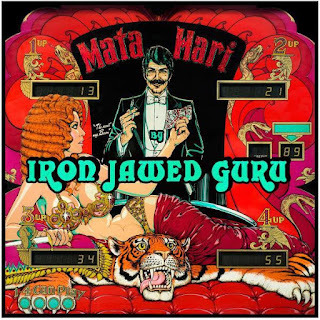 Keep an ear and eye out for Iron Jawed Guru as they continue to pile drive us into the dirt with their relentless groove and rhythm.